How to Spread Bet Successfully? IG: How to Sign Up? There are some brokerage firms that come around once in our lifetime and change the way we envision the markets, and that is a big plus on the side of the clients. Such an institution has done such a thing, and it is DF Markets, they have come up with trading technology that is not rivaled by many in the industry, and furthermore they have ensured that they are the main and the most dominant in this space. As many may know or not DF Markets is one of the top providers of CFDs in the world, and that is a very massive position to beat, and the pressure is massive as well. So, they need to hold up their end by providing technology that can support their massive number of products. So, DF Markets has created several DF Markets platform options that have their clients the ability to face the markets with the right tools that have proven to offer a superior advantage over the rest of their competition, it may seem unfair, but that means you are using the wrong tools and this you have yourself to blame if you find yourself falling short and not meeting your desired targets, that is why you need to be part of the winning team DF Markets. Before we get to the DF Markets platform review, it is important to know the background of DF Markets. As like every other stellar organization in the world DF Markets have come a long way to become one of the best CFDs brokers in the world and that makes it way easier to get into business with them. They are a London-based firm with more than one office around the world in the well-known financial districts. The fact that they are a United Kingdom based brokerage firm it is almost obvious that they will be regulated by the Financial Conduct Authority which they are, and they have a reference number 534027, and they are registered as a company both in England and Wales under the name Delta Financial Markets Limited, and their company number is 07280005. There is a reason you may want to choose DF Markets, and that may be their client fund protection measures that they enforce, that maybe they are well regulated with multiple assets on their portfolio. The other reason maybe they offer spread betting services as DF Markets spread betting, or maybe they may be the best choice for you because of their client service, and furthermore, they have one of the best prices in the industries, and their spreads are very tight. The other reason may be they have multiple platforms, and it is one of those things that are key to your growth as an individual. The technology part of the business is key to the growth of any brokerage firm, and if you are not working hard enough to improve this aspect of your business, then you are almost certainly going to fail. The thought of having a single trading platform is very risky considering that different market conditions affect the way trading platforms perform and that is what made DF Markets focus on building multiple trading platforms to offer their clients an option when engaging in the markets. The best tools for the job is exactly what every trader needs and that is what DF Markets offers. They have three trading platforms the DF Trader; this is a downloadable proprietary platform that is fully customizable and has the best analytical tools and is based on the Microsoft.NET technology that both robust and holds well to the active market conditions. 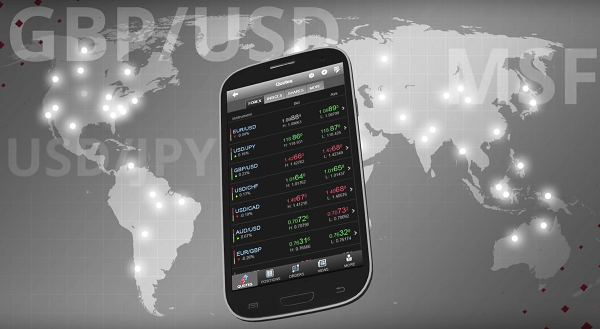 The platform holds over 1,100 forexes and CFDs products, the thought that you can be able to access such a massive number of products to trade is almost unimaginable, but that is what DF Markets offers. Then there is the DF Markets webtrader that has been a major part of their growth over the years, many people want efficiency, they do not want to clutter their computers with applications that have an actual run on their memory space but rather they want to access their trading platforms online with little hassle and get their business going from wherever they are in the world. 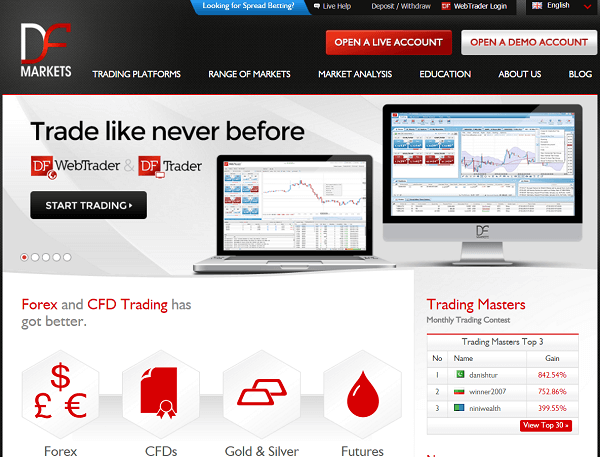 They do not have to think of the time difference because all that is covered on the DF Markets webtrader platform. The last of their trading platforms is the DF Mobile platform, as a trader you want to be on top of your game at all times you may miss opportunities, but with the mobile platform, there is a chance to save yourself some of the agonies of missing opportunities. All the platforms are optimized, and they cover your trading pretty well as long as you have a login you can access either of the three and get on with your job. The traders have the need and desire to trade different products, and that can only be made possible by the broker. 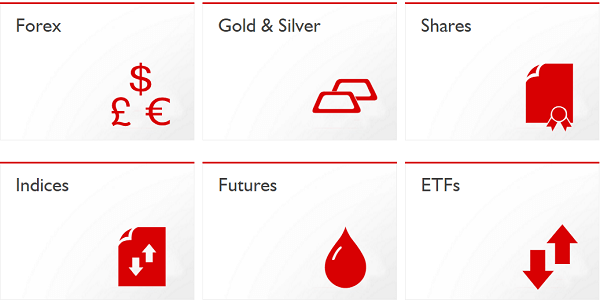 DF Markets has 4 different asset classes including forex, futures, indices, and shares. This makes up a very nice mix when creating your portfolio to trade. All these are well priced, and the spreads are tight as well, so you will always have the best products on offer. With DF Markets, you are going to have a very competitive atmosphere because of the DF Markets contest that gives the clients a chance to prove their worth and get cash prizes and other incentives. Every client wants to feel appreciated, and this is what DF Markets has centered on improving year after year. They focus on their clients’ needs and improve on them consistently. They have developed technology and channels to improve on this, and this is what has made their client numbers to grow and maintain a level of professionalism throughout.